Prior to a church in Jackson, Masses were held in homes and the American Legion building. Father Gerard Schellinger came once every six months. Between 1936 and 1955, priests came to Jackson whenever they could to serve the needs of the people. Father John O’Connor tried to come once a month. We were a mission church served by Kemmerer. During this time bazaars, bake sales, and breakfasts were held in order to raise funds to convince the Bishop that we should become an independent parish. At this time there were thirteen Catholics in the valley. Lots for the first church were purchased for $225.00. 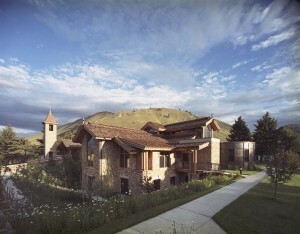 Our Lady of the Tetons and the Sacred Heart Chapel were built in 1935 by Henry Dale at a cost of $6000.00. The original church was located on property now occupied by First American Title. The original church building now stands as the Virginian Restaurant. It took parishioners several years to decide to build a new church. The new Our Lady of the Mountains Church was designed by Kellogg and Kellogg in 1955. Ground was broken for the new church in 1962 on land donated by Josephine Spicer. The estimated cost of the church was $90,000 but the final cost came to $116,000. Slim Wassenberg was the contractor. The John Wort home was purchased as the rectory. The 25th Anniversary of the parish was celebrated in 1980. Father Doudican was the first permanent priest and faithfully served the parish for 11 years. They continued to grow and in August, 1987 the parish had 192 families. During the ensuing years, Our Lady of the Mountains parishioners saw many modifications and improvements to the church building to accommodate the growing and changing Catholic population within the Jackson community. In 1988, under the direction of Father Richard MacLellan, the parish hall was expanded and additional classrooms were added. Year-round tourism and an influx of Latino residents began to impact the services offered on the weekends as overcrowding became a serious problem. Thirty years after the current church was built, it was again time to expand and change. This time it was a major undertaking. Serious planning began in 1995. Planning received considerable attention for a time and then circumstances delayed continuation. Time passed and then in early 2000, a $3.5 million Capital Fund Campaign was launched for a complete renovation of the church with the prayerful theme, “Something Beautiful for God and Our Lady.” Under the leadership and spiritual guidance of Father Carl Beavers, the present Our Lady of the Mountains church was dedicated on August 10, 2003. More than 1000 attended the Dedication, Mass and Reception. The project was designed by Ward + Blake Architects, with Ken Mahood as lead designer, architect, and parish agent. Ormond Builders was the contractor, with Gerg Hostert as Superintendent, and Byron Beck as Project Foreman. Our Lady of the Mountains celebrated its 50th Anniversary on May 31, 2005. The Parish community had 685 families and single people registered. As of 2015, Our Lady of the Mountains continues to grow with over 1000 families and single members, about half of the parishioners being of Hispanic descent. In 1937, a donation of $1500.00 was offered by the Catholic Church Extension Society, in the name of Mr. and Mrs. James Hudson for the erection of a Chapel in the Moran, Wyoming area. 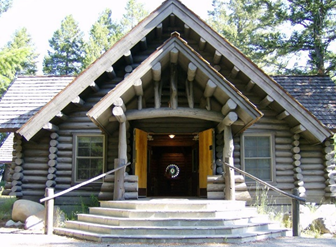 Accordingly, the Chapel, built entirely of logs, was erected on the shores of Jackson Lake. The Chapel was dedicated on the Feast of the Assumption, August 15, 1937, by the Right Reverend Monsignor Duane Hunt of Salt Lake City, who also preached the sermon for the occasion. The Chapel, in accord with the instructions of the Catholic Church Extension Society, was named The Chapel of the Sacred Heart. Until 1955, the Mission Church in Jackson and the Chapel of the Sacred Heart were served by the priests of St. Patrick’s Parish in Kemmerer, Wyoming. In that year, Our Lady of the Tetons, in Jackson, was erected as a parish with Reverend James Doudican as the first resident pastor. 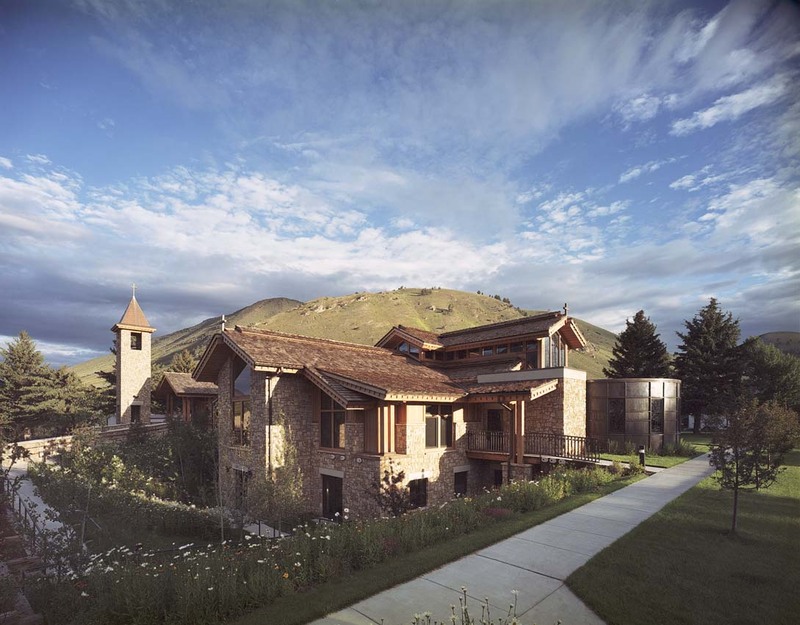 The Jackson parish (renamed Our Lady of the Mountains in 1963) would embrace Teton County and Grand Teton National Park, with the Chapel of the Sacred Heart as a summer Mission. By the late 1960’s, the Chapel of the Sacred Heart was in dire need of repair. With the approval of the National Park Service and under the supervision of Reverend Joseph Moroney, the plans were prepared for the complete renovation of the historical Chapel and to add a small addition on the south side of the building. The construction would cost $25,000.00. Once again the Catholic Church Extension Society came to the aid of the Chapel with a grant of $10,000.00. The work was completed in the summer of 1969 and the Chapel was rededicated to the Sacred Heart of Jesus by His Excellency, Bishop Hubert Newell on the evening of August the 13th in the presence of a host of people from Jackson, National Park officials, summer employees in Grand Teton National Park and priests of the diocese. That 2002 renovation was made possible by a generous gift from a New York and Wyoming family in memory of the victims of the September 11 tragedy. In addition, the Catholic Church Extension Society made a donation to the renovation in honor of the years of service of Mr. Brian Shanon, a board member of the Society, and in memory of the Chapel’s first benefactors, Mr. and Mrs. James Hudson. Today, the Chapel of the Sacred Heart provides a quiet respite for prayer and meditation for the 1000’s of visitors from all over the world who enter her doors every summer. Her pews are filled with, often, as many as one hundred faithful Catholic vacationers at her Mass on weekends between June and the end of September each year. And dozens of couples exchange their wedding vows before the altar in the Chapel in the Sacrament of Matrimony each summer.